Wow, it seems like it's been forever since I posted last, as all three kids have been fighting the flu for the last few days. No one has come in or out of the house, the windows have been drawn and locked up tight and my children turned into pale, thin, unrecognizable creatures. Finally, this morning, it was like they had all gone through a metamorphosis over night. Each of them woke with vitality and a renewed strength, begging to be let free. We opened up the house and headed out into the woods for an easy hike, snacking on dandelions and rinsing the germs away under a warm shower of rain. Feeling renewed myself, I decided to dye some wool and thought you might like to see it's transformation from a single skein of yarn to a completed project. First, I wrap all the yarn into a skein on my homemade niddy noddy. Next, I remove it from the niddy noddy and soak it in room temperature water for about an hour. 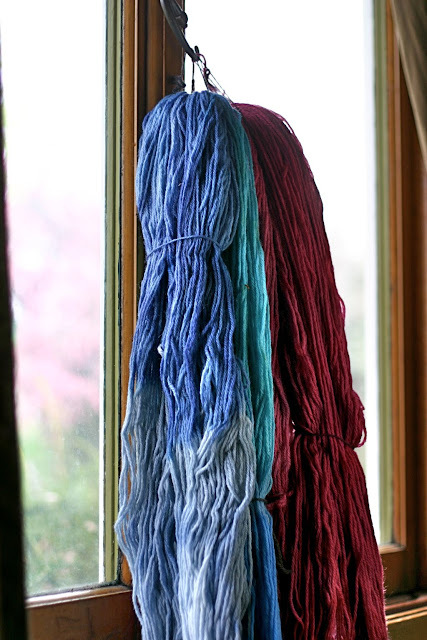 Mix all the dyes and add yarn to the dye pot. With low impact dyes you just let the wool simmer until all the dye has absorbed. Only one rinse is needed, no chemicals go down the drain, no toxic mordants needed to set the color (only vinegar), and the water can be recycled for the next batch! I wash it with a bit of my home made organic castile soap and rinse. Squeeze all the water out with a towel and hang to dry. When it's dry, wind it into a ball and knit! This yarn is for a custom one~year~old hooded sweater that I'm starting tomorrow. I'll post pics of the progress throughout the week.